Green Berets and Mercenaries in Yemen: What Else is Washington Not Telling Us About US Participation in Yemen? 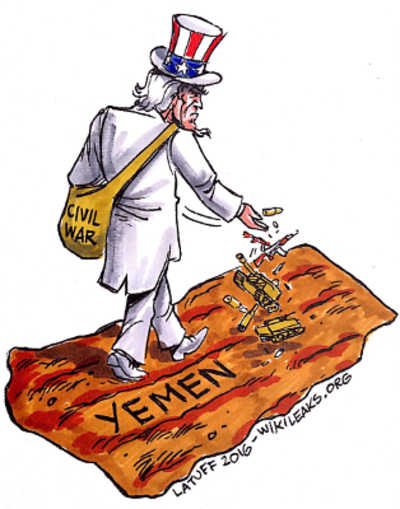 Sana’a (GPA) — For the past three years, the United States has attempted to disguise, manipulate, or outright deny its involvement in Yemen. Nonetheless, new facts come to light every so often that indicate Washington’s participation in the Saudi-led war is much more hands-on than officials let on. The recent news about Green Berets deployed along the Saudi border highlights the ever-growing U.S. role. So, what else is Washington not disclosing about the US in Yemen? The United States regime has consistently downplayed its role in Yemen while news emerges that counters this narrative. Let’s take a look at everything the United States has done while insisting its role in Yemen is passive. News emerged last week that Green Berets are stationed along the Saudi-Yemen border to assist Saudi troops. A report from the New York Times says 12 commandos arrived back in December. The NYT received this information from American officials and European diplomats who claim the Green Berets’ only mission is to destroy weapons caches belonging to Yemeni forces. This timing coincides with a high-profile long-range missile launch by Yemeni forces targeting Riyadh in response to the ongoing airstrikes. The missile launch in question took place in early November. This is the same missile launch U.S. ambassador to the United Nations, Nikki Haley, used fragments from to suggest a U.S. war against Iran. The NYT’s sources said that the Green Berets have not and will not participate in direct combat with Yemeni forces. Ansarullah (aka “the Houthis”) troops known as Yemen’s Army and Popular Committees have not shared any photos or reports indicating direct combat either. At this point, the “no direct combat” claim seems to stand. It’s worth mentioning that the US deployed these Green Berets in December yet Yemen’s resistance forces have launched countless retaliatory missile attacks on Saudi targets since. This week, Buzzfeed reported that a former U.S. Army lieutenant now serves for the United Arab Emirates. Prior to joining the Emiratis, Stephen Toumajan served as a lieutenant colonel for the United States throughout most of his career. Although Buzzfeed broke the story, this information comes from Toumajan’s own admissions as well as an Emirati’s government website. The U.A.E. speaks highly of Toumajan as “his excellency” and promoted him from his previous U.S. Army lieutenant position. He now serves as a commander for the U.A.E. Joint Aviation Command manning helicopters. Depending on who’s asking, Toumajan may deny his official status — it is, after all, a very gray area legality-wise. When it came to a recent child custody hearing, the American Emirati commander quickly back-peddled on his official involvement in the foreign military. This highlights the growing instances of using for-profit hires (bluntly: contract killers) to bypass standard military norms and international law. Saudi Arabia and the United Arab Emirates both utilize Blackwater mercenaries for boosting their military ranks. These countries have flooded Yemen with foreign fighters to kill indigenous Yemenis on their own soil. Fighters often hail from Sudan and many Latin American countries like Columbia and Mexico. The U.A.E. takes particular advantage of this market and it’s very common for foreigners to serve under the Emirati banner. Mike Hindmarsh, for example, is a retired Australian senior officer who now serves on the U.A.E. Presidential Guard. This strategy allows the United States and western countries to station troops in Yemen without stationing troops in Yemen. Last year, reports emerged that the US in Yemen helped the United Arab Emirates establish a series of black-site detention centers throughout territory under their control. Inmates at these 18 detention centers cited unspeakable torture. One device, known as “the grill,” roasted victims for interrogation. Guards smeared detainees with feces and crammed them into what looks like shipping containers in Yemen’s intense heat for indefinite amounts of time. Beatings and electrocutions are commonplace. Conditions look similar — if not much worse — to the infamous Abu Graihb U.S.-run detention center in Iraq. According to the Associated Press, U.S. and Emirati troops rounded up civilians without any justification as part of sweeps to flush out suspected al-Qaeda militants. It appears as though the prisons still function. Shortly after Trump’s inauguration, Yemen made headlines. But the war-torn nation didn’t break news because of the genocidal bombing campaign. No, Yemen made headlines because a Navy Seal died in a disastrous raid against suspected al-Qaeda militants — the Trump regime’s first official military action. Not satisfied with the result, Washington ordered a similar raid just months later. The first raid left 25 civilians dead while the second killed at least five. Many readers may not know that a very young girl died during one of these low-key raids — she was an eight-year-old American citizen named Nawar al-Awlaki. A 70-year-old partially blind man also died. Again, Navy Seals did not leave the scene unscathed. In fact, conflicting reports cast doubt on Washington’s official story. According to local Yemeni sources, tribal fighters (not aligned to any group) killed or injured at least 30 U.S. and Gulf troops during the second raid which took place in May. Yemeni sources also say that al-Qaeda fighters were not present in this particular area of Marib province during the attack. Securing oil-rich land from rogue (anti-U.S. but not “terrorist”) indigenous tribal groups. Bad intelligence — highly likely considering the U.S.-Saudi coalition’s general military failures in Yemen and on other battlefronts. Something else that Washington hasn’t (and probably won’t) disclose. Considering that Yemen is known as the “secret war,” whatever the true goal of the mission was is anyone’s guess. Yemen is isolated: the blockade restricts access to both foreign and domestic journalists. As a result, detailed reporting about U.S. involvement is hard to find — especially in regards to remote Yemeni islands like Socotra and the Bab el Mandeb. Socotra is a small island between Yemen and Somalia and its territory belongs to Yemen. Abu Dhabi has used their war in Yemen as a springboard to challenge regional Saudi hegemony — with remarkable success. For just about every Saudi failure in Yemen, you’ll find a success from the Emirates. The United Arab Emirates began occupying Yemen’s Socotra — a UNESCO World Heritage Site — early on during the war. Residents aren’t fond of their presence and have no desire to participate in the mainland’s war. Emirati troops recently bribed Socotris during a private door-to-door census: future cash and benefits for a possible vote to secede and become part of the U.A.E. Abu Dhabi’s assertiveness in Yemen has certainly rubbed their allies in Riyadh the wrong way. Considering Washington’s close relationship with the Emirates, it’s hard to imagine that the U.S. is sitting on the sidelines during this land grab. This activity would require extreme stealth to avoid angering Washington’s allies in Riyadh. Saudi Arabia and the US in Yemen have used the war as a testing grounds for military action and weapons. Despite the United States condemning Syria for suspected chemical weapons, the US has no problem selling chemical weapons like white phosphorous to the Saudi coalition to use in Yemen. In the war’s early days, Yemeni forces detained a large number of trucks in Marib province. The trucks contained materials which militants could use to manufacture sarin gas. Yemeni sources believed the weapons came from Turkish planes under the cover of humanitarian aid. The United States also sold cluster munitions to the Saudi coalition before coming under international pressure from rights groups. Cluster bombs — previously manufactured in the United States until very recently — are internationally banned. Even recent reports suggest the Saudis still use cluster bombs in Yemen. It’s unclear whether the United States or the United Kingdom provide the supply or if Riyadh is working through an old stockpile. The United States isn’t supposed to have any troops stationed in Yemen. Washington maintains that its role in Yemen involves two key goals: supporting the Saudi coalition and countering al-Qaeda influence. Last summer, Emirati troops greeted U.S. soldiers in Yemen at a remote airport in eastern Yemen. Together, they conducted a special mission to push AQAP militants out of key oil fields. Now, the Emiratis and U.S. occupy some of Yemen’s vital oil supplies. Fighting al-Qaeda in Yemen poses a significant challenge for the United States because their Saudi-allied fighters consider the terror group an ally against Ansarullah. For one thing, AQAP leader Qasim al-Raymi openly admits his men fight alongside U.S.-backed troops. Terror attacks are common in territory controlled by U.S. allies. AQAP and ISIS militants frequently target Emirati-backed politicians and officials with car bombs or assassination attempts. When the UN Special Envoy of the Secretary-General for Yemen visited the war-torn country, he could not visit specific areas controlled by the US-Saudi coalition due to the threat posed by terror groups. The UN Special Envoy did not have this same experience in Sana’a and territory under Ansarullah control. What Else is Washington Not Telling Us About the US in Yemen? U.S. support for the Saudi-led bombing campaign has produced over 36,000 casualties between killed and injured. The airstrikes typically target homes, schools, businesses, farms, fishing boats, water treatment facilities and just about anything else you can imagine. Washington also helps enforce the Saudi-led blockade which restricts imports, exports, and the flow of movement. This has put roughly 22 million Yemenis into either food insecurity or direct famine. Medical supplies are scarce and thousands of patients suffer the consequences — cancer patients, those requiring kidney dialysis, and pregnant women are most at risk. On top of this, the United States has carried out covert military actions in Yemen for over the past three years. From deploying Green Berets and occupying oil fields to running black-site torture centers, the US in Yemen has ignored all international laws and norms. What else is Washington not telling the public about the US in Yemen? Featured photo: U.S. Army photo by Staff Sgt. Cain S. Claxton, 7th Special Forces Group (Airborne).